Me love you long time Irwin! Oh God. This is soooooo Irwin. Oh man, you have that essential Potty Pal 7"? As a kid, I always had 45 rpm records and had to tape a nickel to the top of the arm of the needle of my record player to keep it from skipping on my Soupy Sales and Lorne Greene. Soupy Sales - The Mouse! Lorne Green - Ringo! This sounds like Steve Jones on guitar. Great tone. Joe Meek - the man of 1,000 singles. The flexidisc... round and square at the same time! Singles Going Steady Week means surreptitious FUNDRAISING. Please tip the widget atop the playlist, folks. Thanks! Hey hey hey hey, Irwin! Wikipedia: "Monsoon's third single, "Tomorrow Never Knows" (a cover of The Beatles), featured guest appearances from Bill Nelson, Preston Heyman (Kate Bush), Dave Balfe (The Teardrop Explodes) and Merrick (Adam and the Ants)." There's David Garland.. and his razor blade. Sounds like a robot trying to yodel. Human League are such an underrated band. Are the vocals supposed to sound like they're coming from the next room? Hey, Happy Back to the Future Day, everyone! It's also my daughter's birthday today. Yay! Happy birthday to Ken's kid. I'll bet Hyde Park is really nice today. Oh snap, it's mine's birthday today too. what parq said, ken! happy happy, roberto! METZ. Record of the week. You can always tell a Joe Meek production! Honeycombs...a while back, someone on FMU had the German version of "Have I the Right." @Ken from Hyde Park/Roberto- that's awesome! I'm sure you're girls are just as angelic as mine. I believe I'll believe it when I see it. J & the A's cover Traffic. I believe the revolution will not be televised! Aw thanks, you guys. It's a nice day for all of us here. Hell is a place where something is always happening? Shanghai Noodle Factory, must be the flip side- what's on the obverse? When does potty training happen? @Rstvmo - I am ashamed. I hate that typo. @JakeGould - I'll let you know...been working on it for a while. Jan: the other side of the J&As is "French Provincial." Doris Knoll for Speaker of the House. I think the Parrot training record is a 10", so that doesn't make the cut. Say, what's the exact moment that Back to the Future arrived on Oct. 21, 2015? They just flashed something on the TV screen, but I didn't catch it all. @psyNs - OK, makes sense, except for the time zone part. 30+ years ago, as kids, Irwin and I usedta go drivin' around north Jersey constantly, buying tons of cheap used 45s, for our FMU shows. Methinks me actually hearing some of them again today. ^ RSM is correct. Some of those finds featured today. This is really disturbing, Irwin. Does the FCC know you're playing this? I can't wait to find out how this ends. I wanna hear a mastercut of all the times she says 'potty'. Can we hit 75% of pledge total for this? $20 will do it. way WAY beyond expectation Irwin. You guys weren't kids 30 years ago. All right, he said 30+ years. I'll give you that. U gotta fight for your right...to POTTY! Record of the year! I work with people who could use this record. Be sure to play Side B also. Hooray for RRG (hi RRG!) and me too--sent a pledge earlier too. Irwin, what's on Side B? OK, Irwin. This record's on my Discogs Marketplace want list. I'll have to grab this audio. Have to. That may be the most disturbing thing I've heard in 15 years of listening to WFMU. Congratulations Irwin. and klark kent! nice, irwin! There, you see? Lulu isn't played enough. On WFMU or anywhere else. Good show. I was skeptical because I don't like vinyl (much) either. But I remember I felt the same way last year when you caved, and I liked that show too. Love it but I'm skeptical that there's a 78 RPM disc spinning on that turntable next to you at this moment. I'm voting for the party that doesn't want power and doesn't want to tell people what to do. That was the jauntiest song about dirty commies I've ever heard. 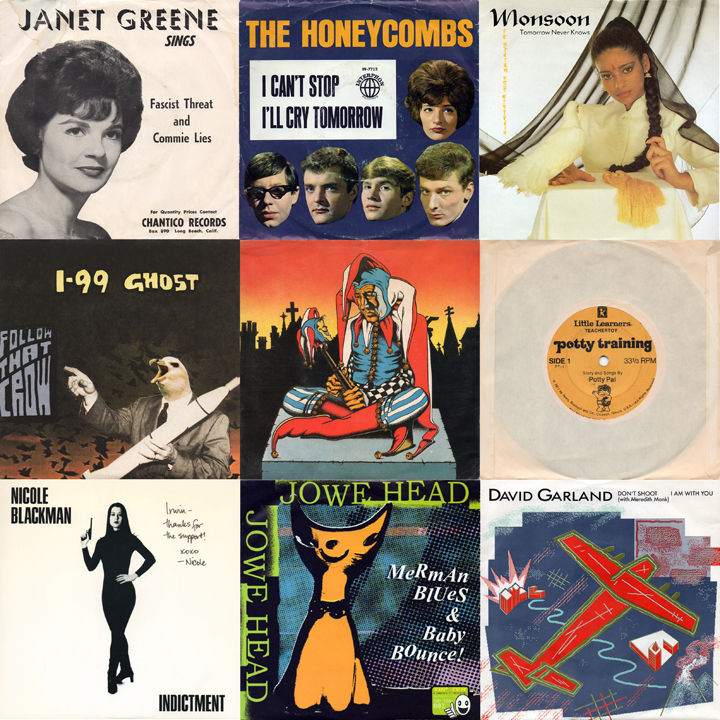 an owner of a record store handed me a copy of that Janet Greene record once. She was horrified that it existed but knew no one in the store would buy it. I got so many peculiar records that way. Always loved the Ivy League. Only three pledges this entire shift. Anyone got a few bucks to toss in the bucket? Hit the widget atop the playlist. Thanks and good karma to you. Two Dreadful Children in the house. TOMMY I$ A MAN OF HI$ WORD. In my youth, the search for Jorgen Ingmann's single, Apache went on for a few years. I finally found a copy in Farmingdale, L.I. at a record store. I was still a kid and treasured it for years to come, only to have forgotten it along with the metal carry case of other 45s at my parents just prior to their yard sale. A few years later I realized my error. Apache his greatest hit, as born out by the CD reissue of an album of Jorgen. That Tommy, he has me in stitches, I'm telling you. Sorry you lost your 45s, jan. I lost all mine too. My brother stole them and then lost them. He would deny that but he'll never read this so I don't have to mince words. YOU TOOK THEM AND YOU LOST THEM, STEVE! Get Ready For Your Chore! At least Potty Pal doesn't grunt. OH GLOB, MAKE IT STOP!!!! Who knew that potty training could sound so creepy! @rrg Yeah, missing the records and sleeves. Music from 1962-66 0r so, then started buying albums. Many of those were saved from the tag sale, but in hindsite, I realized that some other LPs should have been retrieved, such as Spirit, Moby Grape, United States of America and other jems, that these days, Irwin spins on his show. Stick to Pampers. That's what I say. Fortunately, jan, you can now get most of that stuff on CD. @rrg. True, and have done that. Still that box held another treasure: a cassette audio tape I had made of the last cigarette commercials broadcast on TV.How did I forget it??? Yeah, losing the irreplaceable stuff really hurts.